Edie has been relentlessly bullied, and she's come to the end of her rope. Mysterious and beautiful boy Kian shows up to make her dreams come true. That is, if she signs an agreement with him and his magical faction. She's skeptical, but decides she has nothing to lose. Her desire for revenge against her bullies outweighs everything. And she knows exactly what she wants from Kian. Over the summer he makes her beautiful, transforms her. She'll be able to slip into the crowd that devastated her life. She'll destroy them from the inside. As it all unfolds, Edie learns more about Kian's world and what it is their agreement requires. His world is a dark world, filled with cold and harsh people. Like Edie, Klan has a dark past and she wants so badly to trust him completely, but something's standing in her way. "An interesting premise . . . For teens with a penchant for fantasy/horror mash-ups." --School Library Journal Bullied and humiliated, Edie is set to exit this life when Kian, a preternaturally attractive stranger, appears with an offer that is more appealing than jumping off a bridge . . . her inner dialogue keeps readers on track with her persisting insecurities, ensuring that readers will be fully on board as she prepares to do battle in the promised sequel. "BCCB"
This will be a popular, fun, and fast-read series that can encourage discussion about true beauty, friendship, popularity, loyalty, and choices. "VOYA"
Aguirre has crafted a sophisticated novel that combines science, horror, and romance amid the realities of high-school cultures. Readers will eagerly anticipate sequels to this frightening, exciting, and erudite celebration of smart teens. "Booklist"
*The story has a freshness and intelligence that puts it at the top of the grenre . . . A standout trilogy opener. "Kirkus Reviews, STARRED REVIEW"
An interesting premise . . . For teens with a penchant for fantasy/horror mash-ups. 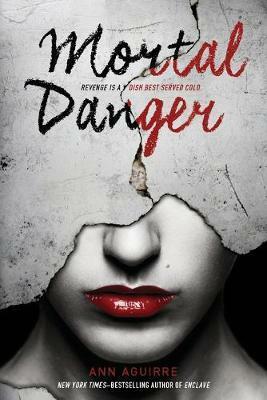 "School Library Journal"" Praise for "Mortal Danger"
"Aguirre has crafted a sophisticated novel that combines science, horror, and romance amid the realities of high-school cultures. Readers will eagerly anticipate sequels to this frightening, exciting, and erudite celebration of smart teens." - "Booklist"
"An interesting premise . . . For teens with a penchant for fantasy/horror mash-ups." - "School Library Journal"
"In her first young adult novel, Aguirre (the Sirantha Jax series) has created a gritty and highly competent heroine, an equally deadly sidekick/love interest, and a fascinating if unpleasant civilization. This series is likely to hold considerable appeal for fans of "The Hunger Games."" -- "Publishers Weekly"
"Enclave is dark and thrilling, fast-paced and intense. With some graphic and gross imagery and a hard look at a post-apocalyptic world, Aguirre has taken themes from Scott Westerfeld and an assortment of zombie literature and created something that is very much her own -- and a very engaging read." --"RT Book Reviews"
"This well-paced zombie-esque adventure in an urban wasteland will keep fans happy." --"Kirkus Reviews"
"Aguirre's young adult debut is a gripping survival story set in an apocalyptic future. . . This is a tense, action-packed dystopia with intriguingly gray characters. . . " --"Booklist"""
"Deuce's passion for life, even in her bleakest moments, is contagious, and that passion exemplifies the nebulous force that has driven all of these individuals to persist in the face of awful options." --"The Bulletin of the Center for Children's Books"
Ann Aguirre is the author of the New York Times- and USA Today-bestselling Razorland trilogy (Enclave, Outpost, and Horde). She lives in Mexico with her family.